Audi is celebrating a world premiere at the Auto Shanghai 2013 by presenting a new member of the A3 family, the new 2015 A3 Sedan. The much anticipated A3 Sedan was first shown on Audi MediaTV with a sneak preview last month on the eve of the New York Auto Show. Audi has announced they will broadcast live via satellite the world premiere of the new 2015 A3 from their press conference at Auto Shanghai today. How can you view the live coverage? Audi will provide live stream on Audi MediaTV, the Audi AG Facebook page and also via the AudiMedia app. Audi Communications will provide access to the live broadcast, along with comprehensive background information. In the U.S., Canada and South America, the broadcast will be today April 19 at 9:30 -10:15 pm EasternTime. The broadcast will be shown live around the globe from China. Audi’s smallest offering in the U.S.
Audi intends to set the bench-mark in the class with the all-new 2015 A3 Sedan and it will compete with the BMW 1 Series, Volvo V40, and the all-new Mercedes-Benz A-Class. Audi will be launching the new A3 Sedan around the globe along with the new three-door A3 hatchback and new five-door A3 Sportback. Audi is launching the performance S3 five-door hatch with a new engine and more horsepower. Audi has revealed the new 2015 S3 will come with a reworked 2.0-liter four-cylinder with more horsepower and better fuel-efficiency. The 2015 A3 Sedan is a completely new model for the brand and will arrive in the U.S. later this year. The 2015 A3 is Audi's smallest offering in North America and the new A3 sedan will represent the first time the company will offer a four-door variant in the U.S. The new A3 will offer both a front-wheel-drive version, and a more expensive quattro all-wheel-drive version. The new A3 will likely be powered with a new TFSI 2.0-liter engine that will come mated to either an optional six-speed S tronic, or a six-speed manual transmission. The new reworked engine is 11 lbs lighter than the previous generation powerplant and will feature improved performance. It will come with new technologies, ranging from dual injection through the Audi valvelift system and an exhaust manifold integrated within the cylinder head to innovative thermal management. The live stream can be called up via http://audimedia.tv. Audi is also making it possible to incorporate the world premiere of the A3 Sedan into your website as a live stream. Interested fans can also follow the live stream on the Audi Communications Facebook page www.facebook.com/AudiAG. Audi Communications will be providing the stream to users of mobile devices via the AudiMedia app. For information on the app and on how to download it, see http://bit.ly/audi_media_apps. 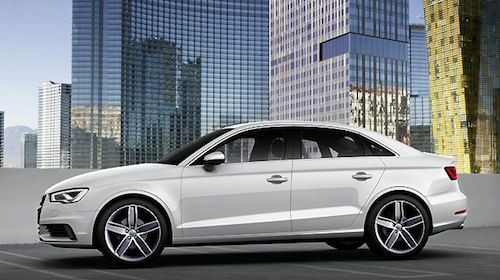 Look for the all-new 2015 Audi A3 Sedan launch to be later this year.